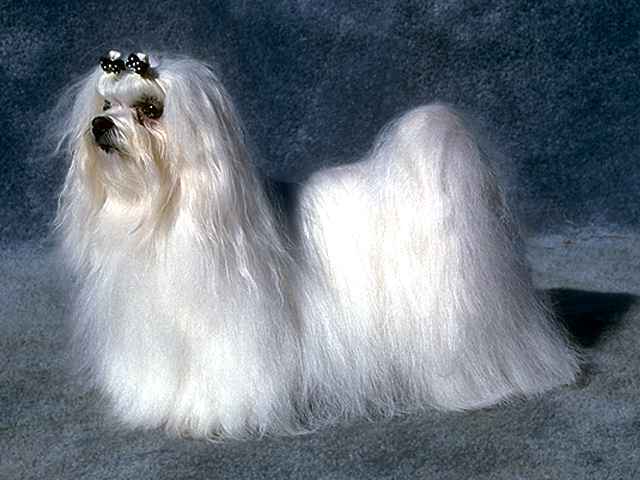 The Maltese is a Toy breed whose distinguishing characteristic is a coat of long, silky white hair. The medium length head is well proportioned to the body, with a gently rounded topskull and a moderately accentuated stop. Eyes are fairly close set, round and dark brown to black with an expression of softness yet alert intelligence. Like the head, the muzzle is medium in length and not overly wide or thin. The nose is black, and the teeth feature a scissors bite. The neck is long enough for the dog to carry the head high and proud. The body is compact and well proportioned with a level topline. The tail sports silky long hair and is gracefully curved over the back. The coat is long, straight and silky in texture, nearly reaching to the ground. The dog has no undercoat, and coloring is always white. Height (Male) 9 - 10"
Common Misspellings Maltease, Malteese, Mahltese or Malltese. They love the company of human families and are energetic and affectionate. 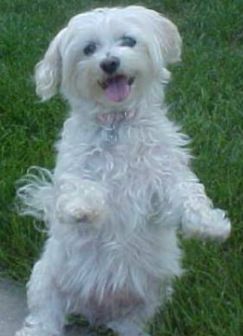 The Maltese responds well to training and can be taught a variety of entertaining tricks if rewarded sufficiently. 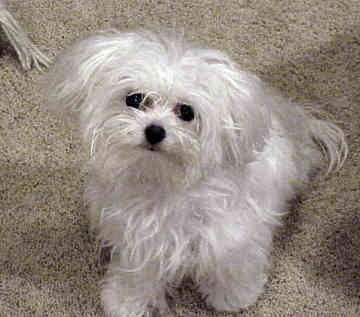 Though too small to confront an intruder, the Maltese love for barking makes it an excellent watchdog. It is important to socialize your Maltese from puppyhood as an overly coddled or sheltered Maltese can become neurotic or snippy. Like many small breeds, they can be challenging to housebreak and sometimes picky with food. 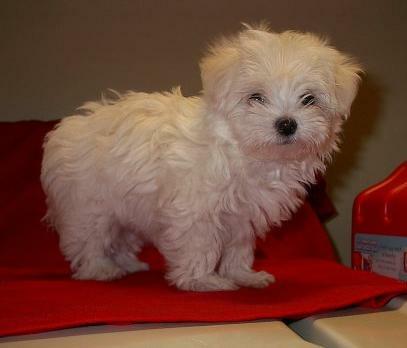 Children should be supervised when playing with a Maltese, as the dog can easily be injured by rough handling. They are small enough to get plenty of exercise inside, but enjoy a daily walk. It is crucial to comb and brush the silky, long coat daily to prevent the formation of mats and tangles. The Maltese needs regular bathing, at least once a month, but must be kept warm during and after. If you prefer, you can use a dry shampoo periodically. The eye area is prone to staining and must be kept clean. Keep ears clean and trim excess hair from them. 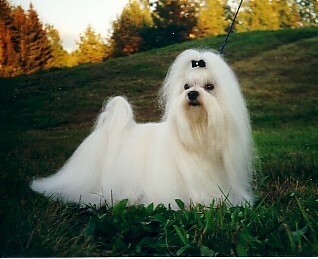 You can have your Maltese clipped to make care easier. These dogs don't shed very much and are excellent pets for people with allergies. Maltese has always had a way of inspiring uncommon devotion from their owners, and there are many stories of people going to great lengths to please these dogs. Publius, a Roman governer of Malta, had the renowned poet Marcus Valerius Martialis write a poem about his Maltese, Issa, and even had the dog immortalized in several paintings by some of the preeminent artists of his day. Ancient Greek art and literature makes repeated references to the diminutive dog of Malta, and even suggests that tombs were erected for especially pampered Maltese. As time passed, the Maltese made its way to the drawing rooms of 19th century England, where they were the preferred pet of the rich and privileged. Both Queen Victoria and Queen Elizabeth owned Maltese dogs. In the late 19th and early 20th centuries, the breed was introduced to the United States, where it was recognized by the American Kennel Club in 1888. To this day the Maltese has held onto its popularity, and is currently among the 15 most popular breeds in the United States.